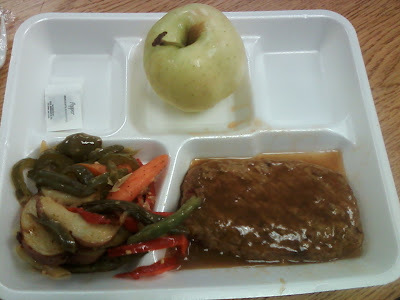 Contents: Fresh apple, beef patty with brown gravy, vegetable mix (potato, carrot, green and red pepper, green beans). Notes: Those veggies look awesome, but that gravy... Shiver. That apple looks like a ghost. It would be nice if this website gave you credit for the photos? Hey guy, most of the photos on your site were taken from my site with no credit given. Also, the lunch in question was submitted to me by a reader.